An update on what has been going on here at Rail Scale Miniatures. 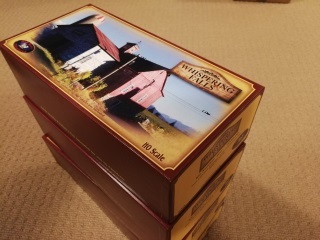 First off, I would like to apologize to all of those that pre-ordered the awaiting Whispering Falls kit. This one has been a beast for me to get out in a reasonable amount of time. My full-time job has kept me away for some time, so the manufacturing process on this kit has suffered considerably. I would like to inform everyone that I am very close now. All the drawings and instructions are completed, packaging is done as well. All wood laser cutting and a whole lot of strip wood bundles required for this one is completed as well. I am now currently working on pouring the Hydrocal Walls and White Metal Castings. You should all see your kits very soon. The size and complexity of building a barn literally board by board was quite an endeavour. You will not be disappointed. As usual, just writing the LED portion is like writing another manual. Again, thank you for all your patience. On another note, I would like to announce the acquisition of South River Model Works white metal detail castings portion of their business. Rail Scale Miniatures now own the rights to all the original, production masters and molds of all those beautiful detail parts that Bob Van Gelder has created in his wonderful 25-year career as one of the worlds best kit manufacturers. The legacy of his work will carry on with the use of his detail parts to accompany my collection in future RSM Craftsman kits and starting this Fall, you will be able to purchase these parts as well. How I well sell these, I am still contemplating, but it will all be explained once I have decided. As for all those loyal customers to Bob Van Gelder and SRMW who have purchased his kits and those who got them in the secondary market, I will honor the same rules as I apply to my kits and those of Bob. If you are missing a white metal detail part, please contact me for a replacement part. More information and details will be provided as we get close to releasing these gems to the Model Railroad hobbyist. There is nothing like taking a drive through the grassy pastures of a countryside road on a beautiful fall day. We tried to capture that look and feel of the great outdoors and open spaces with this year’s new true craftsman kit Whispering Falls. With the large beautiful old barn, which has been standing for years and an addition that was added for more storage of farm equipment and feed. A quaint stone farmhouse across the road along with a storage shed and chicken coop to finish off the scene. There are a lot of new changes we made with this kit to previous releases. The one and foremost is the barn. It is literally built board by board, including the interior framing. The only thing laser cut is the roof trusses. The foundation for the barn consists of wood and resin components. We have introduced Hydrocal castings for the farmhouse, which is a first for us using this medium in our kits. The Hydrocal molds for the stone farmhouse were made especially for RSM by Ed Fulasz. Once again we have used our traditional lighting package for Whispering Falls, you also have the option to buy a gas welder simulator. You can view a video of how it looks on our website. We installed it in the shed, where a farmer is repairing some farm equipment. The effect is sensational! This will be sold as a separate item through Ngineering as well as the lighting kit. We also added sound effects to Whispering Falls; it is truly amazing! The quality and the realism bring you to the life of living on a farm. You will find samples for the two sound modules we used in the diorama on the web site. The sound modules will be sold separately through Ngineering. Also, I would like to mention, I am almost out of the older kits, there is no better time to purchase an RSM kit then right now for our American customers. With the Canadian dollar so low compared to the US Dollar, all the kits are literally 30% off. Our kit prices are and always will be in Canadian funds.